If your windshield has a crack that is larger than a dollar bill, it won’t pass the safety inspection when it’s time to renew your registration. You will need to repair or replace the windshield before you take it in for an annual inspection. There are some options for do-it-yourself windshield repair, depending on what type of glass damage you have. Most windshield repair kits contain some kind of composite material, such as resin, which you use to fill in the crack or chip. It will also contain a syringe, which allows you to draw up the resin and place it in the spot that needs to be filled. There are also windshield repair options that are for professional use, which will usually contain a pump that pulls the air from the crack so it can completely seal up tightly. These kits may also include a UV light, which you can use to speed up the drying process. When you perform windshield repair, be cautious of anything hitting the newly repaired glass, as this can cause the window to shatter if it gets hit in a certain spot. 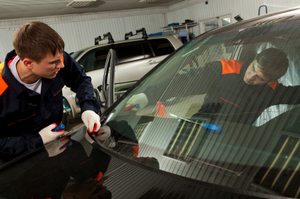 Many people choose to leave their cars parked for a few hours following the windshield repair process. If doing your own windshield repair sounds like too much work, bring it in to Freedom Glass Company. We have a team of technicians who can perform windshield repair quickly, and will use high-quality materials to make sure it is done right. We offer windshield repair and replacement services to residents within a 50-mile radius of Mooresville, North Carolina.